Match tasty treats in this fun and challenging match-3 adventure!You're the chef and your friends and family are your customers. MAIN FEATURES: - Hundreds of addictive puzzles with more added all the time! - Amazing arsenal of powerups & combos! - Free & easy to play, challenging to master! 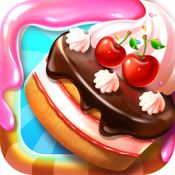 - Stunning graphics & adorable animations!